Yeah, I'd love to hear anything at all from them. There's no need for it to take this long to at least update us. "We are making new boards that can be compatible with old and new models... it will need some days. Please wait patiently, we will sell the boards at cost price. $10 for boards and $8 for shipping cost for old users. If you want, please reply your address with post cods and phone number, I will record it firstly, once the board available I will inform you." So ... is "some days" equivalent to 6 weeks (and counting) - for them to sell us new boards to replace the ones that never worked properly in the first place? And it sounds as is the rest of you people haven't even got to the "spasm" problem in the last two digits yet which a few of us have. My clock is sitting on the back of a shelf, ignored. @Sportster I did the same, even provided my info I think. I also provided my details and am happy to pay for an upgraded board. My clock has just started the flicker of unreadability on 5 of the 6 numbers. It eventually stops and goes back to normal but will go back to flicker mode. People on this forum are more than happy to purchase a new board, we would just like to know when it will become available and how to go about ordering it. sry fot all dealy , and infact we start free hardware fix (but shipment cost needed , sry) for a long time . but some KS customer hardware fix are delay,beacuse the KS version need upgrade mother board and side button board && side wood board . because now version can adjust mode and color without computer. Glad to hear it. Will be resending my info shortly. Love the sound of the upgraded features as well. http://store.eleksmaker.com/index.php?route=product/product&path=104&product_id=221 you can directly order form this link , and choose your machine type. @EleksMaker-Z planning to order as well but I have noticed an unusual issue with your checkout. Pretty sure I shouldn't be able to see those other addresses! @csroc @EleksMaker-Z @EleksMaker-Customer-Service @EleksMaker-CEO Agreed. That is a serious issue and has been reported before so needs to be corrected immediately. I'm glad to see the fix posted, hope it works and stays alive. But, like others have already posted I am concerned about my person address staying available on the internet like this! The displayed list of 11 "Existing Addresses" aboove only shows if you have yet to create an account. 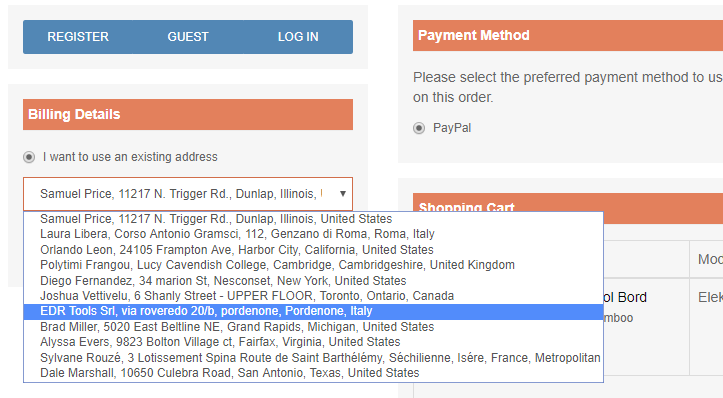 Once you have created an account to place an order, the only address visible under your account is your address info. This does not appear in the list of available addresses once you have created the account and will continue to only show the 11 addresses in the above screen shot. oH, we will try to fix that right now!! @Zax must be fixed, thx! I received my new upgraded board kit today. Unfortunately this did not fix the current issue with my clock in that 5 out of the six displays constantly flicker so that the values are unreadable. With the old controller board, the flickering would stop and start intermittently, so not flicker all the time. This is still occurring with the replacement board upgrade as well. The device did not flicker on the original power supply until 6 weeks ago. I have tried with 4 different USB power supplies and all give the same flickering result. After troubleshooting with cs@eleksmaker.com directly I was able to isolate the flickering issue to the second LED board on my clock and they have organised shipping a replacement. Well done to them. Does this upgraded board fix the clock accuracy? Does it fix the flickering last two digits on the 6 bit version?